The site is on 8 acres of flat well drained grassland. (We have no problems with cars or caravans ever getting stuck). We pride ourselves in keeping the grass and surrounds well tended. Privately located and surrounded on each side with hedging, trees or fishing lake, it feels like a secret hideaway! Access is via an electric gate and on site there are toilet and shower facilities – also for our disabled customers. A washroom for pots, pans and a washing machine is also available. 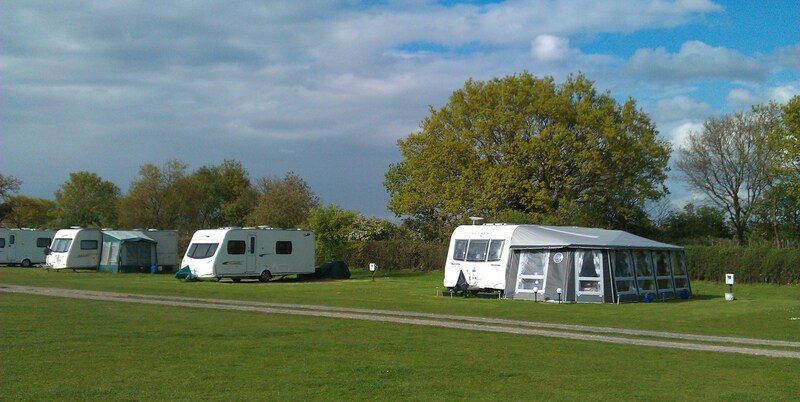 We like to have a relaxed feeling on site, and understand that family and friends all want to camp together, so as long as space permits – tents and caravans / motorhomes – can all camp as a family together. That’s what it is all about isn’t it? Want to get even more away from it all? We have plenty of space to camp where you can get away from the crowd and enjoy the feeling of free camping. No electric available however for these spots – and it is a slightly further walk to the washblock. Just book a non electric point from our on line booking system and ask at reception when you arrive.